Winder, GA Violin Lessons Near Me | Fun Classes. Top Tutors. Check out some of our most popular teachers near Winder, GA including Atlanta, Marietta, Decatur, Alpharetta and Duluth. Whether you're 3 or 103, if you're playing violin (or starting to play!) I hope you're EXCITED about it!! Over the years, my students have said that their lessons are/have been their favorite times of each week. I believe learning to play viola should be full of joy, learning, thinking, and feeling. Bring that joy alive for yourself by partnering with me as your musical guide. I bring over 30 years of experience and pure joy to my work, and I'd love to share that with you! 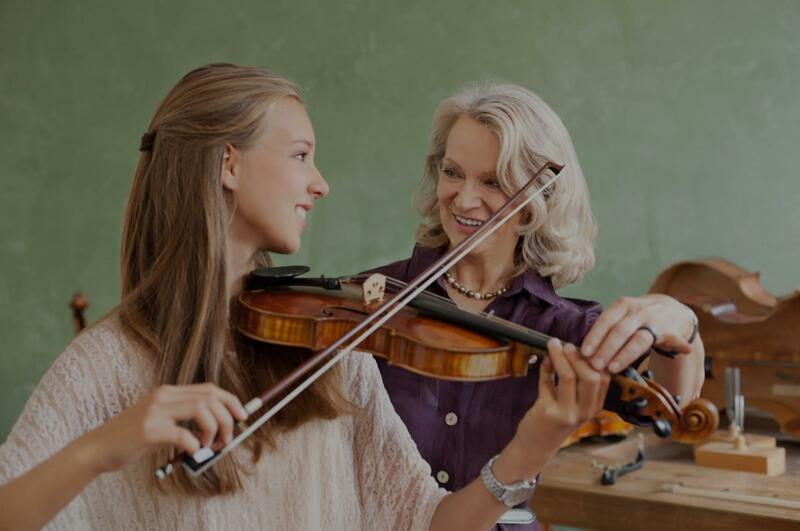 Experienced violin teacher of 39 years available for eager students of all experience levels and ages! I structure my lessons so students learn what they want to learn, while also building a strong foundation of counting, concentration, coordination, precision and note reading skills. I specialize in traditional European method. Hi There! I am a violin, viola and piano teacher with over 39 years of experience as a professional violinist. I earned a Master of Arts degree in Violin Performance and Instruction from the Higher Musical Pedagogical Institute in Plovdiv, Bulgaria. I teach traditional European method, and my students’ ages vary from children to adults. Many of my students play in the Webster University Music School and the St. Louis Symphony Youth Orchestra. All of my students read notes and count very well. I look forward to helping you achieve your goals as well! Very knowledgeable and experienced in not just playing the violin but teaching it as well. At the age of 58 I decided to start taking violin lessons for 2 reasons, enjoyment of playing music and exercise my brain. I found Lucy K on the takelessons.com website and she was able to accommodate my request for lessons in my home on a Sunday. Starting from scratch, she taught me the fundamentals of playing and I have made some progress over the last 8 months. She is patient with me yet will push me along and at time bring me out of my comfort zone, which is good. She has the ability and training to teach students from early age to older adults like me. In addition, she also teaches piano, which my wife started lessons with Lucy K at the same time I started violin. She has my recommendation if you have interest in either violin or piano. I teach to each persons strengths. Whether you are a beginner or more advanced, I focus on helping you become your best. I am both a Texas and Missouri certified teacher. I recently relocated to the St. Louis area from central Texas where I owned a fine arts private teaching school and also tutored students from elementary through high school levels. I have vast experience in all types of performance including theater, art, and music. I really enjoyed the lessons. Karen is a fantastic teacher. Very flexible schedule and comfortable environment. She has accommodated any pieces that I have thrown her way, and I'm thrilled at the progress I've made since starting as a complete novice 8 months ago. 5 stars! Without Karen by my son's side, I don't think he would've gone as far as he did! After just a few years, he was hired to perform solo at a wedding. She made the lessons fun and enjoyable for him, while always encouraging him to do better! We were so sad to see her leave and miss her terribly! 1. Developing a well-balanced lesson plan that benefits the student. 4. Communicating progress with the parent and student. Hi, there! My name is Brooke and I am excited to work with you! I've been teaching private lessons since 2014 and have loved helping my students learn to read music, make progress by setting weekly goals, and working on performance skills to build confidence. I am currently available to teach lessons at my retail location and online. Below you can view my teaching policies as well as FAQ about lessons with me and learning violin. I look forward to helping you meet your goals! 1. Provide an instrument and any other required books or accessories needed for lessons. 2. Encourage a consistent practice time and acknowledge their efforts. 3. Be on time for your lesson. 4. Communicate any questions or concerns with me. Please come prepared. Your lesson is time for instruction, not practice. For online lessons I suggest logging on in an environment that is quiet and free from distractions. To make the most out of your lesson time, I suggest logging on to your lesson with your assigned music, other assigned work if applicable, instrument tuned, a pencil, notebook, and trimmed fingernails. Please be on time when logging on for your lesson. To start out, I recommend students purchase Essential Elements Volume One for Violin before the first lesson. This book will cover basic note reading, rhythm, form, and more. Then, we will work in whatever you would like to learn as you become more comfortable and confident with the basic fundamentals. Learning the basics is critical to learning the violin, but I want to do everything I can in my power to make your lesson experience fun and memorable! Q: Can anyone learn the violin? A: Yes! I have worked with students as young as four years old, and as old as eighty. You are never too young or too old to learn something new! Q: Where should I purchase my violin from? A: If you can, I recommend going to a store location and trying a violin out for yourself so you can get a proper fitting. While purchasing a violin online is convenient, it is hard to know for sure what you are purchasing. Some things to make sure of when purchasing a violin are strings that properly fit the violin, a bridge that curves from the lowest to highest string (not the same height for every string) and pegs that stay put when playing. You also want to make sure your violin will be able to stay in tune for the length of a lesson, which is something a music specialist can help you determine at a retail location. Q: How often should I tune my violin? A: One of the most common questions I am asked as a teacher is how much a student should practice during the week. I recommend that beginning students practice a minimum of 120 minutes (or two hours) a week. This can be divided into 30 minutes a day for four days a week. I have found that these numbers have provided excellent results for students during the first six months of playing. I have been playing both violin and viola for 10 years, and I specialize in any experience level of students. I am highly trained in music theory, technique, and improvisation, and whether you want to learn basic technique, play a Bach sonata, or learn how to improvise over changes in a complex tune, I can help! I am very open to any ideas and desires my students have, and I strive to make learning music both fun and rewarding for the student. I also have a very open schedule to cater to your time constraints, so let’s get started! Can't find a teacher in Winder, GA? asy to work with and challenges me each lesson so that I am never bored and never feel like I am wasting time working on perfecting a two note exercise because he pushes me to play further and further in the practice book. Absolutely the best experience for an adult student (any student, really)."